Marilyn Joy Spenner was born on February 20, 1944 in Chicago, Illinois to John and Dorothy (nee Morgan) Ward. She died Friday, April 5, 2019 at Northwest Community Hospital in Arlington Heights, Illinois. Marilyn was a homemaker who enjoyed spending time with her husband, children, and grandchildren. She was very active in the churches she attended, and led Bible studies out of her home. She joined her husband Art and daughter Amanda in a month-long missions trip to Romania in 2002. 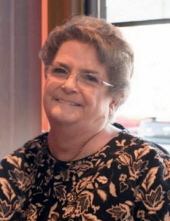 She was a member of Aglow International, a Christian women’s organization, and served on its board for many years. She was a featured speaker multiple times at their events. Some of her many miraculous testimonies were featured in a book of miracles, and she shared them as a guest speaker on radio and television programs. She prayed with most people she met, and told her testimony to hundreds of people during her lifetime. Her interests and hobbies included watching classic movies (especially the British versions), and reading books or her Bible. She loved to cook for her loved ones, and did not let anyone leave her house without a full stomach. When she was younger, she enjoyed dancing (she even danced on television! ), painting, and playing piano. She was a volunteer art teacher at her children’s schools, introducing generations of children to a love of art. Marilyn was the ultimate story-teller, moving her listeners to tears or laughter… often at the same time. Marilyn is survived by her husband Arthur Spenner; her children James C. (Sarah) Spenner, Jennifer L. (Wade) O'Connor and Amanda Joy Spenner; her grandchildren Zachary Spenner, Sean Spenner, Ian Spenner, Sabrina O'Connor, and Eliana O'Connor. She was preceded in death by her parents as well as her sons Joseph, Jeffrey, and Jon (Susan) Spenner. Visitation Thursday, April 11, 2019 from 3:00 pm until 8:00 pm and on Friday, April 12, 2019 from 10:00am until time of Funeral Service at 11:00am at Glueckert Funeral Home Ltd., 1520 North Arlington Heights Road, (4 blocks south of Palatine Rd.) Arlington Heights, IL 60004. There will be a private interment at Queen of Heaven Cemetery in Hillside. "Email Address" would like to share the life celebration of Marilyn Joy Spenner. Click on the "link" to go to share a favorite memory or leave a condolence message for the family.